The 35th Infantry Regiment Association salutes our fallen brother, PFC David Thomas Nordin Jr, RA19359593, who died in the service of his country on November 28th, 1950 in North Korea. The cause of death was listed as Captured-Died POW. At the time of his death David was 23 years of age. He was from Los Angeles, California. David's Military Occupation Specialty was 4745-Light Weapons Infantryman. The decorations earned by PFC David Thomas Nordin Jr include: the Combat Infantryman Badge, the Bronze Star, the Purple Heart, the National Defense Service Medal, the Korean Service Medal, the United Nations Korea Service Medal, and the Republic of Korea War Service Medal. 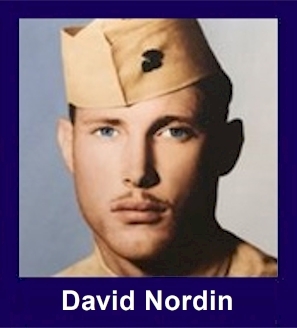 Corporal Nordin was a member of Company K, 3rd Battalion, 35th Infantry Regiment, 25th Infantry Division. He was seriously wounded by the enemy in South Korea on July 27, 1950 and returned to duty on August 21, 1950. He was taken Prisoner of War while fighting the enemy in North Korea on November 28, 1950 and died while a prisoner on January 22, 1951. His remains have been recovered and funeral is pending. Awards: For his leadership and valor, Corporal Nordin was awarded the Bronze Star, the Purple Heart with Oak Leaf Cluster, the Combat Infantryman Badge, the Prisoner of War Medal, the Korean Service Medal, the United Nations Service Medal, the National Defense Service Medal, the Korean Presidential Unit Citation and the Republic of Korea War Service Medal.